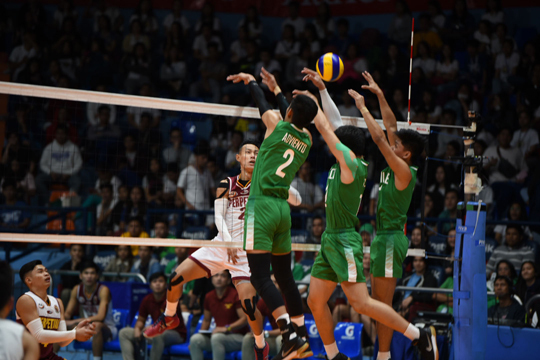 University of Perpetual Help System Dalta launched its triple-kill bid in scintillating fashion as it won its men’s, juniors’ and women’s matches at the start of the 94th NCAA volleyball finals at the Filoil Flying V Centre in San Juan City yesterday. ​The Altas survived an upset try by the pesky College of St. Benilde Blazers with a 23-25, 25-19, 23-25, 25-23, 15-12 victory to seize a 1-0 lead in their best-of-three showdown and inch closer to a seventh title in the last nine years. The Sammy Acaylar-coached, Las Pinas-based spikers are also eyeing their 12th crown that will push them two championships closer to joining the Letran Knights as the league’s most titled men’s teams with 14. And UPHSD will have a chance to accomplish it with another win in Game 2 set next week. A deciding Game 3, if necessary, is set on Feb. 12. Earlier, the Junior Altas overpowered the Letran Squires, 25-15, 25-19, 25-19, to move on the verge of completing a five-peat feat. Power-spiking Noel Kampton went on an attacking spree and unloaded a match-high 16 points, all coming in off kills, while Hero Austria contributed 14 hits to help UPHSD one triumph shy from claiming their 11th crown. Later, the Lady Altas beat the Arellano Lady Chiefs, 21-25, 25-17, 25-21, 25-20. The wins were just the first of many steps needed by UPHSD to claim a rare sweep of the men’s, juniors and women’s titles in one season. Only two schools have accomplished such feat in the NCAA thus far—Ateneo and San Sebastian. Ateneo, a former member, made it happen in 1976, while San Sebastian did the trick in six times in 1984, 1993, 1994, 1995, 1996 and 2002.